You've heard of them - Deep Creek, Hot Creek, Sespe & Saline. Hot mineral waters flowing from the depths of the earth into handmade rock tubs, star filled skies overnight and completely surrounded by nothing but nature. Like a distant dream you imagine a dim, shimmering light, the lunar terrain, the long soak, the clouds, the stars, the sunrise, the breezes in the palms rustling above. 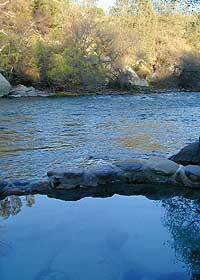 NATURAL HOT TUBS: California Hot Springs are located in rural areas, mostly on dirt roads, some inside or near National Forests. Most have camping nearby, but not adjacent the hot tubs. Most all of these are maintained by local volunteers. Vandalism also closes these special sites off from the public use, so use them wisely. Please respect the lands and the hot tub sites: pick up litter, do not use any soap and keep hot tubs clean. These hot spring tubs are usually built and cared for by locals, not the government agencies that manage our public lands. Most of these special places can be reached by one lane paved or dirt road. SUV /high clearance vehicle may be needed in some cases, but 4x4 is not necessary. Many are hike in only access. Few allow parking your car right next to the springs. Some tubs are so remote, the only way to reach them is by hiking several miles. Get maps and cross reference. 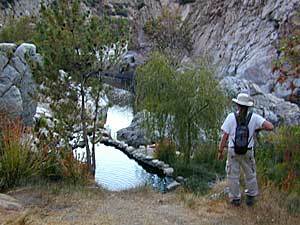 Make an overnight backpacking trip for more secluded hot springs. 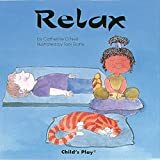 Plan for a relaxing time and exciting adventure. 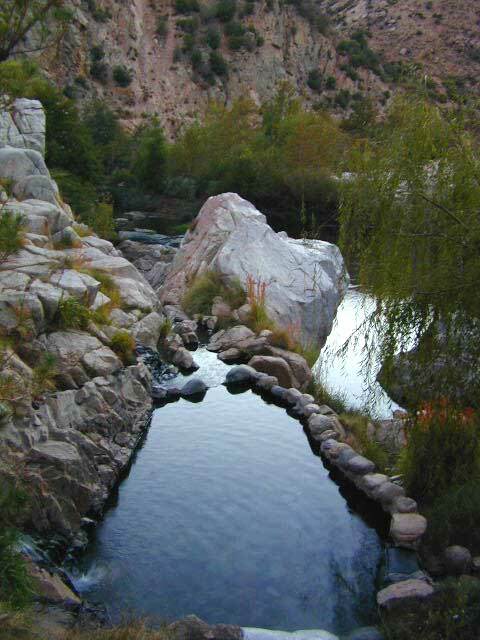 Hot springs are a naturally occurring phenomena. Neither improved nor maintained by the Forest Service. Most of the tubs in these locations are build by volunteer efforts. Please respect these unique locations & leave the place cleaner than when you found it. Footing around hot springs is often poor. Watch out for broken glass, towels, drinks, dogs, clothes and slippery moss. Use caution when going barefoot and don't go alone. At night bring flashlights. Water temperatures vary by site, ranging from warm to very hot. Test the water first for temperature to avoid scalds and burns. Keep alcoholic beverages for afterward, or at least to a minimum. Prolonged immersion may be hazardous to your health and result in hyperthermia, also known as heat stroke. Elderly persons and those with a history of heart disease, diabetes, high or low blood pressure or who are pregnant should consult their physicians prior to use. Respect private property rights. Do not trespass at private hot springs without the landowners permission. Rinse your feet prior to tub entry. Please don't litter. Pick some up! Don't let your dog drink the water. Don't let your dog soak. Don't leave cigarettes/butts lying around. Majority rules: clothing optional can be uncomfortable for some folks. Assess the situation before hand and bring some swimwear if you must. If there are a bunch of tourists and families, you will see more swimsuits. Young people, bikers, campers and hippies, it's gonna be the nudies ruling. open to general public by reservation only from 1am to 3am. $20 fee, payable by credit card only. 1 mile SE of Bridgeport; off of Hwy 395 via Jack Sawyer Rd. West from Blackrock 5 miles is beautiful Beach Meadows. North 8 miles at the end of the road at Blackrock are trails into the Golden Trout Wilderness Area. 2 mile hike into Casa Vieja Meadows, & another 3 miles down to Jordan Hot Springs. 1-3 mi W from Hobo Campground; dirt parking lot near telephone poles; hike in access only .. Both of these can be reached by driving Hwy. 154 N, then right on Forest Service Road #5N12 (E. Camino Cielo to Romero Canyon Rd #5N15 ) Follow signs.